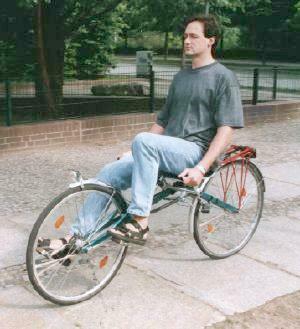 An experimental Flevobike with cardan-drive. 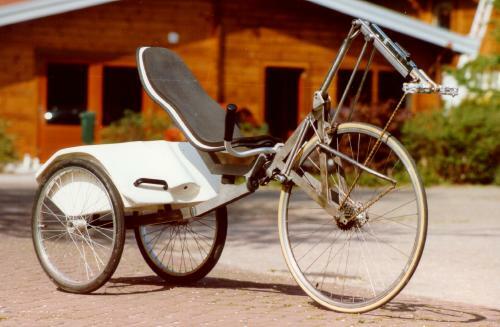 The cardan system was borrowed from a (German) Fendt bike. It is completely closed and has 5 gears. Reasons to stop these experiments were that the system was pretty weak, and easily pedaled into pieces. For a cardan system that would be as strong as a traditional chain-system, a much more expensive and heavier variant should have to be built. A prototype of the german Thomas Kretschmer. He has built a Flevo-like bike, in which the bracket is placed INSIDE the hub. He designed a very special gear hub for this bike: the "Direct drive". Advantages: more compact construction, less maintenance, no chain (grease on your trousers, friction losses) any more. Disadvantages: Bracket is unsprung, and cannot be placed in the most optimal position. Meindert Valenteijn wondered if Flevo riding could also be possible with a linear drive system. 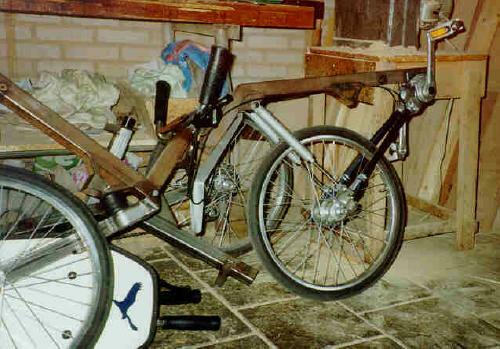 To answer that question, Johan Vrielink welded such a drive system of Meindert to a trike. Because you move both legs into the same direction, you can accelerate very fast. Moreover, you don't have the 'problem' of an asymmetrical steering because the feet are alternately high and low. This trike proved to ride very well. Unfortunately, it was not taken into production because of the costs: There are so many separate parts on it.